Truth triumphs enough if she is accepted amongst the few but right: for it is not her nature to please the many. In Halle of Saxony, in the year 1713 of the salvation of the world, on May 28. Georg Sigmund Liebezeit was born on November 10, 1689 in Sopron, the son of the merchant Paul Liebezeit (who received his patent of nobility in 1702 from Leopold I) and of Susanna Rosina Launer. After the local high school, in 1708 he immatriculated at the academy of Halle. Here he studied with the renowned professors of medicine of the period, Friedrich Hoffmann (1660-1742), Georg Ernst Stahl (1659-1743), and his student Michael Alberti (1682-1757), a founder of forensic medicine. Liebezeit did his examination in this latter subject; his dispute was published again by Alberti in 1730. Then he went to Leiden, where he attended the lectures of Herman Boerhaave (1668-1738). He graduated doctor of medicine in 1713 in Halle. In 1714 he married Esther Katharina Meissner, daughter of the Lutheran pastor of Sopron Michael Meissner. He began to practise in Sopron at the time of the plague. In 1720 he was elected town physician. From 1721 he was a member of the Academia Leopoldina under the name “Nileus”, and from 1723 member of the Scientific Society of Berlin. He was in relation with the Hungarian polyhistor of Pozsony (Bratislava) Mátyás Bél, and supported his great undertaking of describing the whole Hungary. He died in Sopron, on November 30, 1739, probably in the renewed plague. He left 1000 forints to his former high school in Sopron. His funeral oration was addressed by the conrector of the school Dániel Hajnóczy. He had three children; the godfather of the two daughters was the Halle professor Georg Ernst Stahl. His works are: Disputatio medico-legalis de abortus noxia et nefanda promotione. Quam auspice, quam … praeside D. Michaele Alberti publice ventilationi exhibet respondens … d. 14. Januar. A. M.DCC.XI. Halae Magdeburgicae. Halle, 1711. New edition: Halle, 1730. – Dissertatio inauguralis medica de tumore oedematoso podagrico. Praes. Stahlio. Halle, 1713. 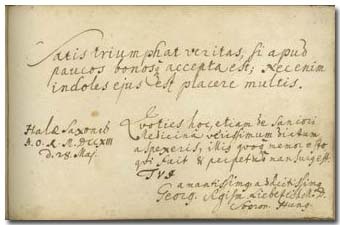 Liebezeit signed in the album on May 28, 1713 as doctor of physician. Both his professors in Halle, the chairmen of his dispute in forensic medicine and in general medicine, Michael Alberti and Georg Ernst Stahl, wrote in the album in the summer of 1714 (pp. 427, 179).